A Father & Son's First Trip to Shear Madness Haircuts for Kids! 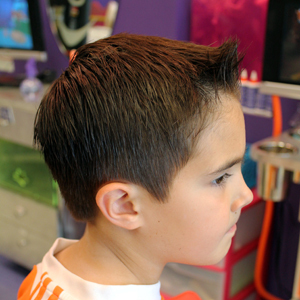 After having recently written about what it is that Shear Madness Haircuts for Kids is about (which can be read right here), we thought it would be fun to follow it up with an actual account of a parents review of a first-time visit to one of our stores! 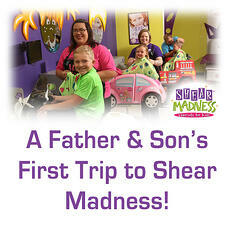 Following is what a father and his son had to say about what it's like to visit a Shear Madness Haircuts for Kids! Matt describes that after learning about Shear Madness Haircuts for Kids from a friend, he made an appointment for his son to visit on a Sunday afternoon. "The receptionist was very friendly, and really sounded interested in what was going on," Matt noted. "This was a great first impression, as sometimes I've called stores and gotten ahold of people who weren't overly enthused to talk to me. It made a difference." Matt then discussed that on the day of their appointment, he tried to arrive with his son a few minutes early. "When we walked in, I could tell this was the kind of place I would have loved coming to as a kid. And I could tell my son was really liking it too. He was drawn to the diecast vehicles and action figures in a cool retail area in the front of the store, and spent a few minutes checking these out while we waited just a minute or two for our haircut. There were a lot of toys and games for boys, but there was also toys and stuffed animals for girls -and there was jewelry, hairbows and hair products too, which was great. I also really liked the look of the store, as it has a lot of bright colors and fun artwork hanging on the walls. And there was a birthday party going on in the back, with karaoke, which added to the fun atmosphere of the place." "My son pretty much knew what to expect for his haircut, but this was the first time he was able to play a game while he was getting it cut. He also could have watched a movie too, but he couldn't resist one of the building games that was available on the game console that he also plays at home. Meanwhile, I was able to stand nearby and watch, and we both gave our input on what we were looking for regarding his hairstyle," Matt explained. 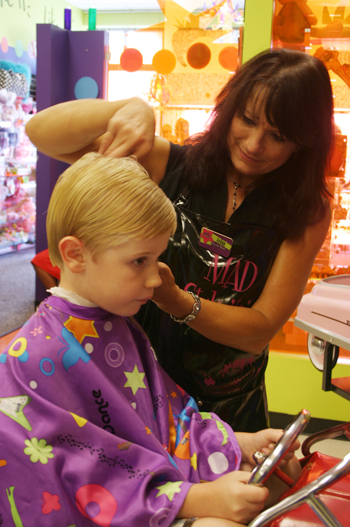 "The stylist was very friendly, and talked to my son about how his day was. She also talked with me too, and seemed like she really enjoyed her job. I saw that there were a variety of vehicle type chairs for kids to sit in while they were getting a haircut, but as my son is older, he sat in a normal sized chair. I later learned that I could have gotten a haircut there as well if I had wanted, and that sometimes adults will come in and get a haircut with their child for the sake of convenience. There's also various haircutting packages, where a mother and son can get a haircut together for a special price, or a daddy and daughter can get one too. 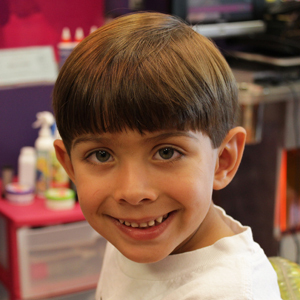 I'll definitely plan on coming back again the next time my son needs his haircut!" When Matt's son was asked about his visit to Shear Madness, he smiled and said, "My Shear Madness trip was so fantastic, it felt wonderful to get manly-scented hair gel put into my hair. I enjoyed playing the games while getting my haircut. I also liked how vibrant everything was, and had fun looking at the toys. I would definitely recommend this place, because it's good!" Are you interested in learning how YOU can join the Shear Madness Haircuts for Kids family and run your own successful small business? 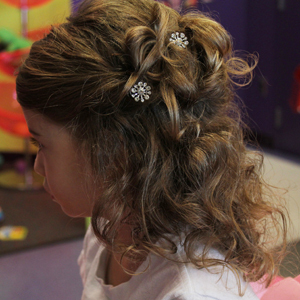 We are one of the fastest growing kids hair salon franchise systems in the industry today! If you would like to learn more about small business marketing, kids salons reviews, kids hair salon reviews, great marketing strategies, resources for small businesses, how to grow your small business, or how to become a successful owner of your own kids hair salon franchise business, please click below or call 1-888-98 GONE MAD. 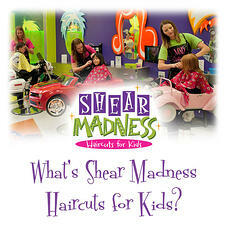 What is Shear Madness Haircuts for Kids? It's true that Shear Madness Haircuts for Kids has experienced phenomenal growth over the last several years, and is opening up exciting new locations all the time. But we understand that there are still those folks out there who just don't know what our concept is about. So here is what Shear Madness Haircuts for Kids is, and how we make it our mission to truly be a place "Where Every Child matters!" 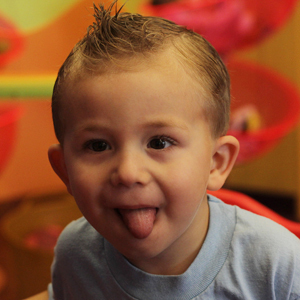 To start off with, Shear Madness Haircuts for Kids is a place where kid's haircuts are our specialty. One thing we're known for is the fun vehicles that kids can sit in when they get a haircut. And while these cool cars, trucks and airplanes are a great way to stimulate imaginative play, we also provide televisions and game consoles so that children can have fun experiences (and not just be staring off into space) while they are getting their fantastic new hair style. But we also understand that some of our customers may be older kids or adults too, so we of course have normal chairs along with televisions and game consoles to interact with (if they so choose) while getting a haircut. 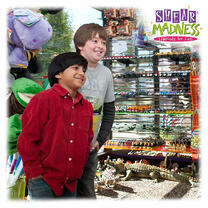 Shear Madness is also known for it's fun and memorable environment. From the moment a child and their parent walks into one of our stores, they know they've entered into a unique place where kids feel special. With happy kids music playing in the background, cheerful staff, brightly colored mirrors, cool lights, the afore-mentioned vehicle chairs, and stylish graphics on the walls, it's hard not to feel like you've entered into a totally new and wonderful kind of magical kids realm! Plus, when you visit one of our locations, you'll definitely have a blast shopping (and playing) in our award-winning YOUniquey Boutiquey! We have tons of great kids retail gifts for birthdays, holidays, or just because. Everything from diecast toy cars, airplanes and trains, to stuffed animals, action figures, toys for imaginative play, dinosaurs, educational games and books, and so much more. And don't forget to check out our amazing selection of jewelry and kids hair care products! Our fantastic bow wall is also a fun sight to behold, as we have a HUGE variety of hairbows in all shapes, sizes and colors! Wow! Another great thing about Shear Madness Haircuts for Kids is the many different services we offer to kids and their parents. We love helping kids look and feel their best through great kids haircuts, but we also offer an amazing ear piercing experience where kids can get both ears pierced at the same time and get treated like a star! And if that wasn't exciting enough - at our La De Da Spa, we also offer fun manicures and pedicures for kids! It's just so cool to see all those smiling little girls in spa robes having the time of their life! First Haircuts are a special time as well, as we roll out the red carpet for this fun event in life with a special certificate, before and after picture and snippet of their hair. Our Parties are also a fun aspect about Shear Madness Haircuts for Kids that many kids and their parents absolutely love. Pink Starlets (girls with pink wigs and aprons) whip up a fun updo, fancy nails, glittery makeup and glitter tattoos for each guest - and karaoke is enjoyed! Some locations welcome boys with super hero parties! All locations take a memory group photo for the Birthday girl to take home. With a Shear Madness Party, we take pride in working hard to help make your special occassion even more special. Kids Hairstyles - Our Favorites! 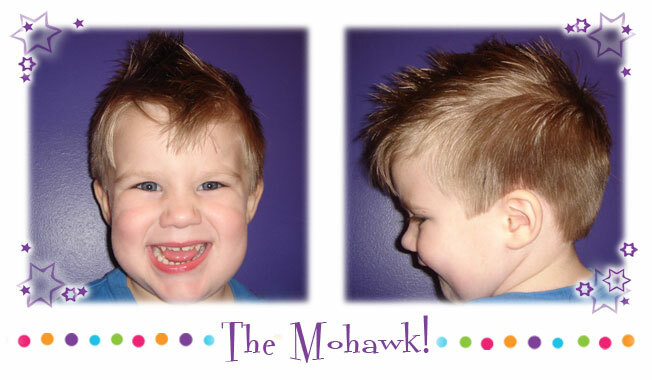 'The Mohawk' Mohawks are The Rage for the boys this year. Even baby boys are getting sweet spikes and Faux Hawks. 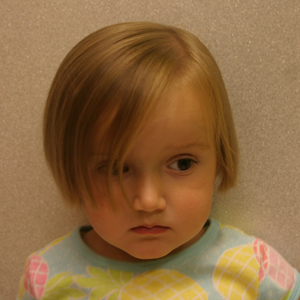 To see more toddler boy haircuts visit our hairstyles section on our website. 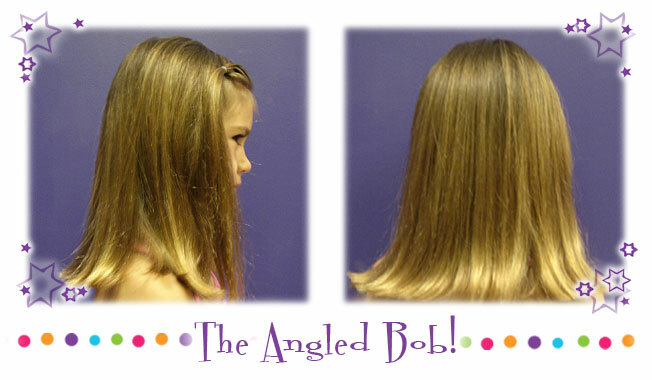 'The Bob' hands down is the winner for the girls. 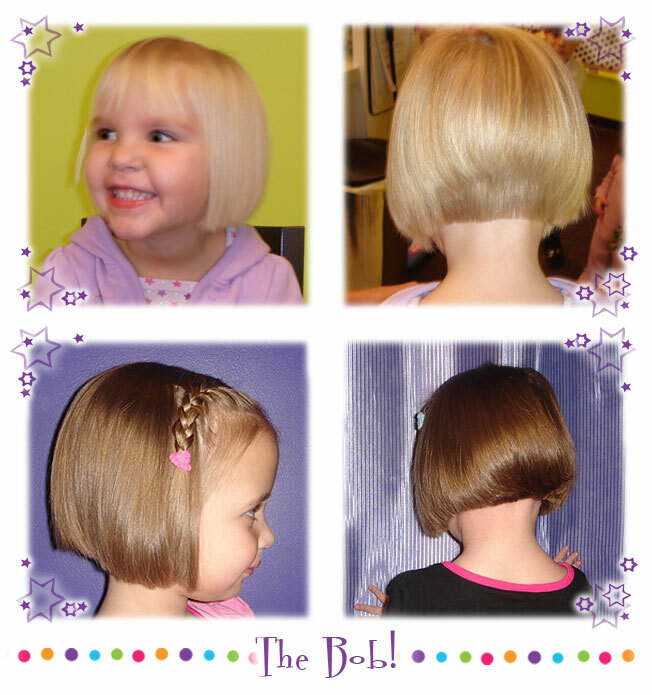 Stacked bobs, layered bobs, inverted bobs for girls are the most popular girls haircuts for this year. 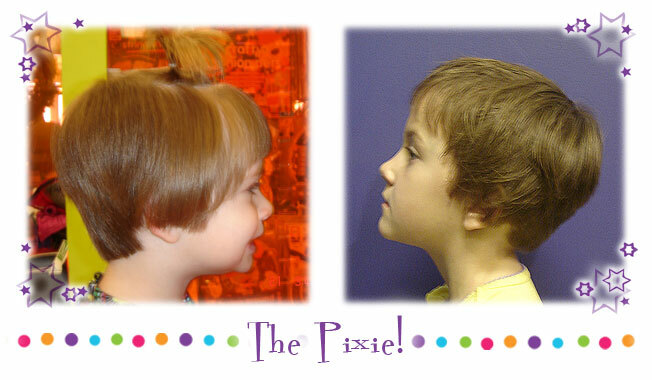 'The Pixie' is the perfect summertime haircut for girls. Simple and fresh it can be worn in a barret, pony, headband, or down. 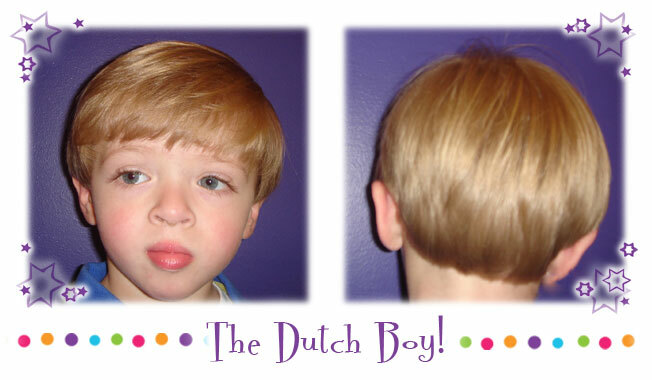 'The Dutch Boy' is a very nice style for boys. It works especially with thick hair. 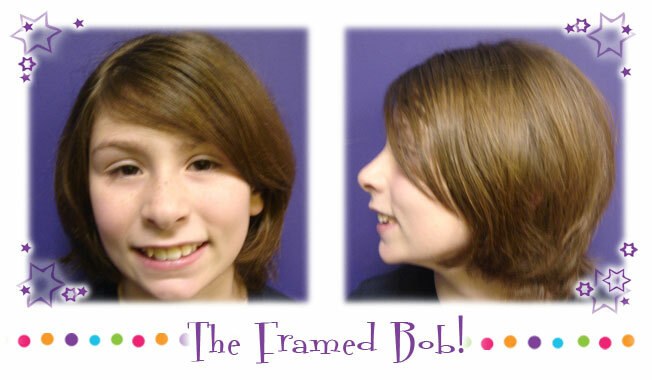 'The Framed Bob' These stylish haircuts for girls (especially with the side sweeped bangs) are another favorite. 'The Shag' hairstyle for boys is a top choice this year. 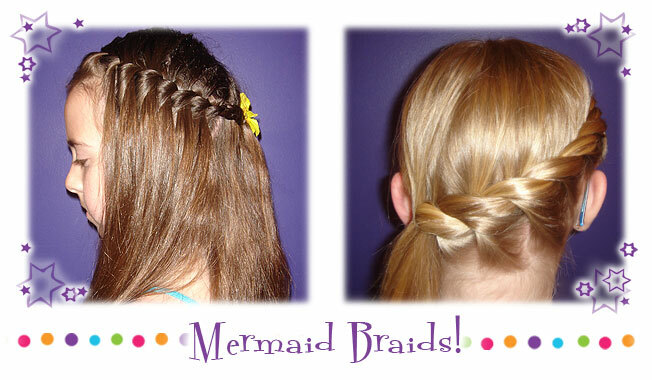 'Mermaid Braids' are a sweet variation of traditional braids & can be worn many different ways. We especially like the asymetrical side pony (above right). So there you have it. We would love to hear your feedback too! Leave a comment or join the fun on our facebook page! 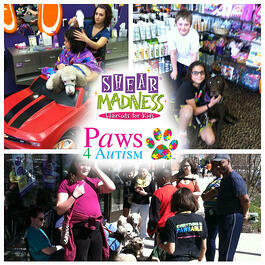 Enter contests, view specials, and recieve other fun hair tips from Shear Madness. If you don't have one of our great salons & boutiques near you, perhaps consider opening one! 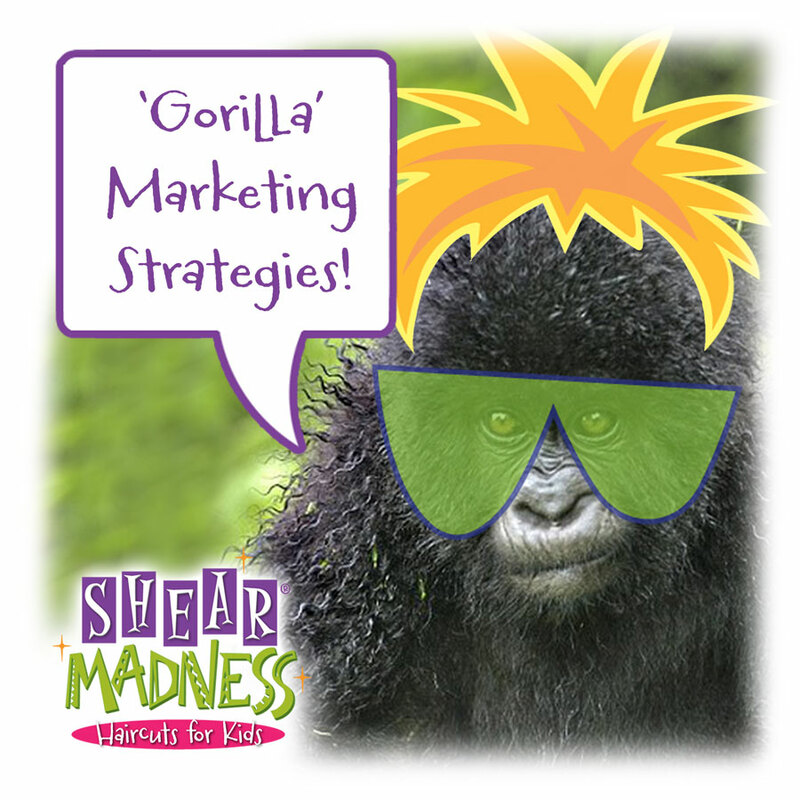 'Gorilla' Marketing Strategies - Tips for Wild Success! We all know that marketing and advertising has changed greatly over the past decade, and keeping up with these changes while growing a business (like a kids salon franchise) can be a challenging feat. Reaching your target audience is key when developing strategies on how and where to spend your advertising dollars. Recently, at Shear Madness headquarters, our brainstorming sessions have led to discussions of alternative, creative and more economical solutions for marketing our business's growth. We decided to open the discussion on LinkedIn to get your feedback, and WOW! We just had to write a blog about it. Below are some of our very best 'Gorilla' Marketing Tips for WILD success! Surprise is everything! Understand what is expected, then do the opposite. For example, you may want to consider hosting an event in an unusual and high traffic location. Remember: Unexpected Placement + Unexpected Timing + Unexpected Message = Unparalled Results! This kind of marketing strategy is so broad it can vary greatly for businesses depending on their goals. To make heads turn and take interest in what you are doing takes guts! A Flash Mob! The wilder the better. Think: What does my Brand do? Then take that to the streets! Build strong relationships with organizations and businesses in the community (every year we head Halloween Parades at each location). Jay Bandy, President of Goliath Consulting Group, shares that for a business focused around kids - schools and churches are the best places to get involved within the communities around each location. Even though you're selling haircuts, you can offer to have muffins and coffee for before or after a church service to get the word out. There are many opportunities with local schools to get involved depending on the school system. Irene Ross says that, Wow, can you ever have fun with this! Do you know someone who's good at writing poetry and songs? I'd have them create an ORIGINAL song about how terrific Shear Madness is and have kids (who are Shear Madness clients) sing it and maybe dance (sort of a flash mob) in a park or the center of town--at a time of day when it's packed with business people out for lunch. And the kids can wear t-shirts with Shear Madness written on them. Sally Davisson says to adopt a non-profit group that has good visibility with your best target customers. And then go all out for them. Have them pass out cards to use that donates "x dollar" to their charity for every person who uses one. If they serve a financially challenged community, offer free hair cuts. Have an in-house contest to raise the most money for them, and have your staff participate in all of their events/fund-raisers. Have representatives volunteer for their committees and help them get the work done. I think that works better than trying to do a little bit for numerous non-profits. You can have the employees vote for their favorite, then maybe rotate every year or so. And in general it might be great PR to offer a free hair style to anyone who is out of work and wanting to look good for interviews? Stephen Nichols states that he thinks a Shear Madness franchise would benefit from a facebook page that offers special deals and discounts. It could be 10 percent off your next haircut or something like 30 percent off for new customers, along those lines. Then use the page to post the discount offers to other pages dedicated to subjects your target audience is interested in. For example, there's a Kansas City facebook page and whenever I want to promote an event for the Rotary Club I use its facebook page to post invitations to the Kansas City page. It's simple, free, doesn't take much time, and if it doesn't work for your business you've lost nothing and learned something. Share Ross points out that they have always found videos to be incredibly effective. Especially if you can make them funny and entertaining! This gets people talking and they feel like they are in your tribe. It's all about establishing an emotional connection - especially when viewers can actually see you and feel like they know WHY you're doing what you're doing... then they are on your side! Melanie Parkers says that one traditional guerrilla marketing technique that has worked well for myself and my clients is to hang out where your target market hangs out - and come bearing gifts. For example, if you own a children's haircut franchise, go to popular parks or outdoor events and hand out branded t-shirts or stress balls along with coupons for your business attached. Just be sure that you target parents! Scott Britton loves the non-profit piggyback marketing. What a great way to give back at the same time as you grow your business! Whatever you do, stick with it! It takes most people a while to connect to your new brand. They need to see it for awhile before they will respond. Also you might try discounts for mall employees and their famlies, and other types of "base building activites". People love to feel that they are getting special treatment. Remember You're essentially relationship building. You're theme oriented and your place does so much to appeal to children as it is. 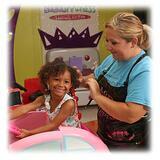 Why not network with roller rinks and other places, like Chuckie Cheese to cross promote? Get two pairs of new comfortable shoes and hit the pavement with cardstock coupons to set on counters. (they have to be colorful and eyecatching, with fun photography that matches your theme - with of course a compelling offer to call your target (Mom's and Dad's) to action! It's time for the Annual Locks of Love Event again at Shear Madness! Locks of Love is a public non-profit organization that provides hairpieces to financially disadvantaged children in the United States and Canada under age 21 suffering from long-term medical hair loss from any diagnosis. Consider donating your long locks to this amazing charity for children! Watch the Video from last years event! 1. Donated hair must be at least 10 inches in length. Curly hair 10 inches when pulled straight. 2. It must be tied in a ponytail or braided for it to be an acceptable donation. 3. Hair cannot be bleached. If you're not sure you can ask a stylist. 4. We cannot accept dreadlocks. 5. Hair that is colored or permed is OK.
Book your Appointment in Advance!! Spots will fill up fast so don't delay. Call one of our salon locations. 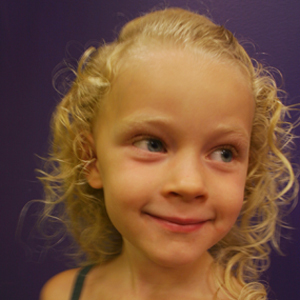 Curly Hair on girls and Classic Cuts for boys are back in for Fall! EXTREMELY Stacked Bobs are raging still at Shear Madness - and lots of SPIKES too!! Even babies are getting Bobs and Fauxhalks!! 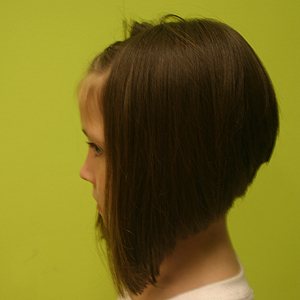 See many more kids hairstyles and cuts for kids by visiting our online gallery! Thanks for looking! Ever thought of Owning your Own Business? Consider buying a franchise! Read all about the advantages of franchising HERE!